Thanks TJ, they look great as always. Wave 2 baby the new batch ! 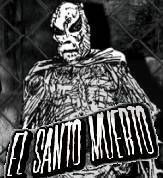 Is it Murte not Muerte ? I can change it for ya. All is good.. I wear with pride..though I gotta once one of them cause Ive been wearing for the past four days.. ^__^ maybe next time I order I can get mine on a shirt. If you can do that Neal that will be cool. I'm glad you guys like them. If Jimmy Pants gets here I have one planned for him. These all rawk with iron fists (the highest compliment I can pay)! Have you seen Wave 1? Love them dog. I cant wait to see mine. I'll try to get the 4 new ones out to Neal this week. Without Your Head © 2005-2016. Powered by Tyler's Engine v1.31. Page generated in 0.03 seconds with 22 SQL queries.